Straightening your teeth creates a confident smile and improves oral health. When your smile isn’t properly aligned, however, it not only causes unnecessary stress when biting but can lead to other dental problems. Dr. Heather Moed, our Manhattan Invisalign provider, recognizes that many patients want an aesthetically pleasing smile, but don’t want to undergo orthodontic treatment with metal appliances. Schedule a consultation today to find out how you can benefit from this innovative treatment! Invisalign clear aligners are custom designed plastic dental trays, precisely crafted to each patient’s teeth. These nearly invisible appliances discretely align the smile, supporting patients’ confidence in their appearance. As teeth continue to straighten, patients graduate to a new set of aligners every two weeks. For effective results, trays should be worn for at least 22 hours a day and removed during mealtimes and cleanings only. This allows patients to benefit from the simplest routines for eating and cleaning their teeth each morning and evening. 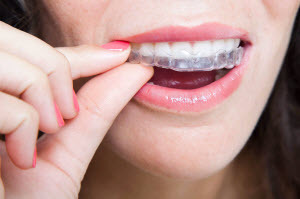 Invisalign braces are commonly chosen because of their aesthetically pleasing design, making them an ideal solution for those looking to maintain their appearance while enhancing their smile, whether for important social events or to finally obtain the smile they’ve always wanted. When in place, the appliances practically disappear, allowing your treatment to look as discreet as possible. In modern dentistry, there are a variety of options available for achieving straighter teeth. Conventional braces and Invisalign dental trays are both designed to correct misalignment and improve oral health. The choices consist of removable aligners and metal brackets and wires. As our dental technology progresses, so do your choices in orthodontics and oral care. In the last 15 years, Invisalign braces have become a popular choice over traditional braces as a remedy. After a consultation, Dr. Heather Moed determines if Invisalign orthodontics will work for you. Patients can expect treatment to last around 12 months, depending on the severity of misalignment. After impressions of your smile are made, Invisalign’s laboratory creates the number of aligners needed to effectively straighten teeth. At Adler Dental, Dr. Moed is certified provider of Invisalign clear braces in Flatiron, Manhattan. For more information on how this innovative treatment can help restore the function and aesthetic of your smile, call our office today!